Come watch the game with us & try some boat house dogs & a flight of your favorite beers at the bar! Top off your favorite salad with a piece of our Chef's mouthwatering Salmon! OR try another flavor from our Salad “Add On” menu options made to your order… House Marinated Steak Tips, Pan Seared Cajun Chicken, Buffalo Fingers, Cocktail Or Buffalo Shrimp, Anchovies, Blackened Or Grilled Swordfish, Salmon & Fresh Lobster in season! Craving something really tasty today? Come try a bite of our Country Fried Spicy Chicken Sandwich ... spicy, crisp & FULL of flavor! February is about to get a whole lot SWEETER with a bite of this spectacular Chocolate Strawberry Cake … just one of the delicious surprises featured on our Chefs Valentine’s Day Menu! Come join us for a very special meal! A Hot Dish for a Cold Winter Night ... at Boat House Grille Essex! Stop by the Boat House TODAY for “Lunch” Or “Dinner” and be sure to try a taste of these awesome brews from our friends at Maine Beer Company! We are tapping NEW kegs of MBC's "Lunch" IPA & "Dinner" Double IPA limited edition available while the supply lasts! In case you were wondering ... MBC comments: LUNCH "Is a special whale that has been spotted off the Maine coast since 1982. She has what looks like a bite taken out of her fin, which adds to her unique character. We dedicate this beer to her determination and persistence. Keep on swimming! ", and DINNER is simply "Please drink this beer fresh." tags / Maine Beer Company "Dinner", Maine Beer Company "Lunch"
Skip the mall & head to our house! We’re OPEN EARLY at 10:30am for GIFT CERTIFICATE sales now through the 24th! On December 26th we invite you to come to the Boat House for “Lunch” Or “Dinner” and taste two very special brews from our friends at Maine Beer Company! Our bartenders will be tapping NEW kegs of MBC's "Lunch" IPA & "Dinner" Double IPA limited edition -- available while the supply lasts! tags / Boat House Grille Essex MA, Maine Beer Company "Lunch", Maine Beer Company "Dinner"
Meet one of our FAVORITE pastas … Buccatini-Carbonara! Imported Pancetta, Green Peas, Fresh Parmesan Cheese And Egg Yolk Sautéed Lightly And Tossed With Bucatini – It’s fabulous - come try! Spread some HOLIDAY CHEER with a Gift Certificate from the Boat House Grille Essex! Available in all shapes & sizes! Come pick one up or give us a call at (978) 890-5113 & we will be happy to mail it out for you today! Spicy Fried Chicken Served On A Bulkie Roll With Spicy Siracha Mayonnaise, American Cheese, Lettuce, Tomato And Onion … for lunch or dinner at the Boat House today! 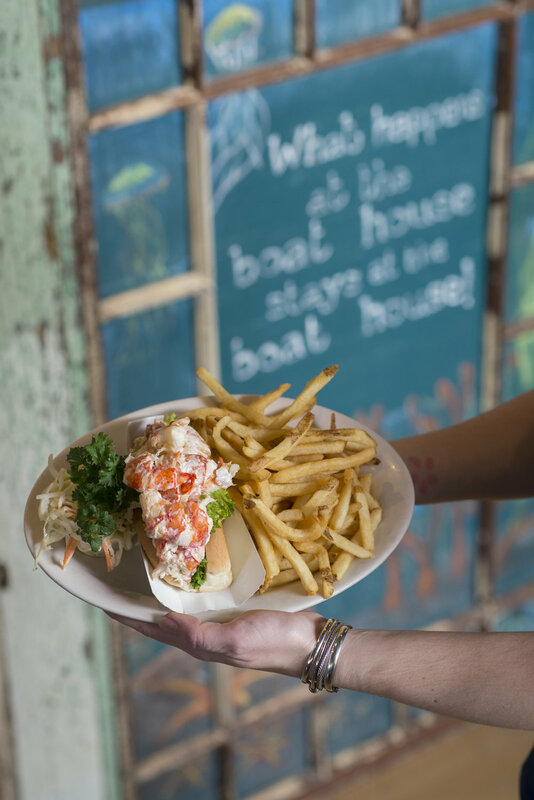 Come try one of our freshly shucked lobster rolls - for lunch, dinner or take out today!